It’s a big question in my house as to who makes the better scrambled eggs, me or my dad. I think I do! 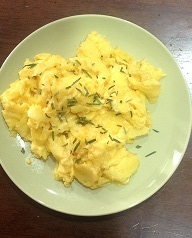 Mine are buttery, creamy and soft (without the use of butter or cream) and garnished with some sort of herb (today I used rosemary, but anything would work). Heat a pan on medium-low heat. Add the olive oil to the pan. Crack eggs into a bowl, add salt, and whisk until your arm gets tired. Make sure you really whip them to get air bubbles. Pour the eggs into the pan. Stir gently and continually for about 5-10 minutes or until they are cooked through, but still have moisture left in them. Remove from heat and garnish with your choice of herb. 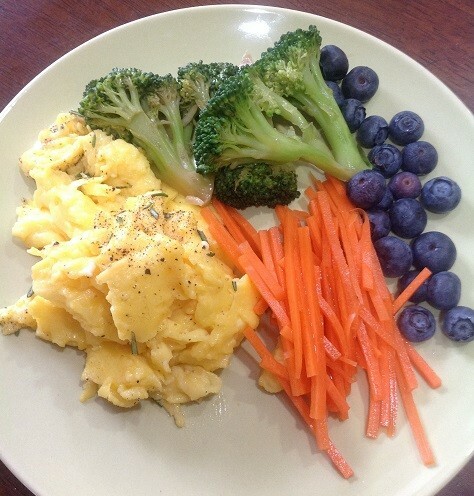 To make your eggs a meal add a veggie and a little fruit for sweetness. Here I added broccoli, carrot sticks and some blueberries.